Showing as £134.91 for me? This is excellent tool! Way better than my previous one . Got it for 99.99 so even better price! Thanks guys. They have added more stock in now. When I looked they had only 4 in stock and they price had rocketed. The combi bit highlighted hasn't updated though! This is what the price will go back too once they have sold the stock down to just a few. Excellent bit of kit alongside the 3 year warranty. Self priming function is good and the mini hose is quite useful for doing a flush out. The detergent bottle is not suitable for use with snow foam the ratio is all wrong so you will only end up with very soapy water. If you are interested in purchasing a lance for using snow foam my advice would be to purchase the Bosch F016800364 Adapter for Karcher - and purchase a Karcher lance to save the hassle of hunting for a Bosch AQT compatible Lance. Don't get fooled by the Bosch and Bosch AQT adapter variants. I have nothing but praises for this pressure washer, very compact, easy to assemble and switch between accessories. For £89.99 its a steal. I have this one. 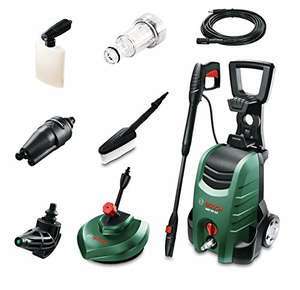 I didn't go much on the patio cleaner attachment, but the standard 3-in-1 head is excellent. If you order now at the £89 price and wait for them to delivery when back in stock does it still cost £89? 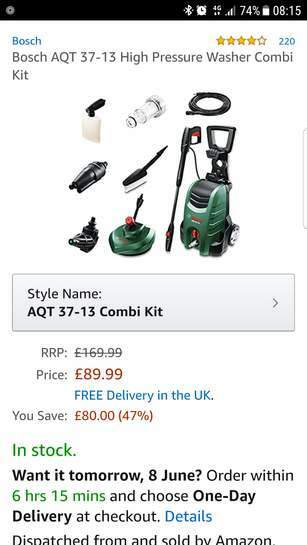 If you order now at the £89 price and wait for them to delivery when back …If you order now at the £89 price and wait for them to delivery when back in stock does it still cost £89? I don't know much about pressure washers, is it really that low?